I aspire to be the kind of person who wakes up before sunrise to get in 2-3 hours of writing before the official “work day” begins. Today, I woke up around 8:30am, lay in bed for another hour, read for a bit, ate breakfast, and finally sat down to write at 10:41am. The above paragraph contains three important elements. The first sentence represents my vision and the second represents my current reality. I discussed these two elements in my previous post, calling them foundational to the transformation journey. If I want to get somewhere new, then I need to know where I am now and where I want to go. But there is a third element hiding in between those two sentences. Can you feel it? Read them again. The third element is tension. There is a gap between where I am and where I want to be, and this gap creates tension. Tension is made up of longing, discontent, frustration, but also the hope that things could be different. Remove the hope and all that’s left is despair. There is no tension in despair. Despair has accepted its fate and no longer looks toward the horizon. But tension–tension calls us forward. It seeks something better than current circumstances, and even if it doesn’t “believe” in hope, the belief is implicit in the seeking. Tension is an essential ingredient for transformation. You might say it is the essential ingredient, because without it there is no desire for change. Creating tension is easy. Simply speak out your vision and your current reality, and tension fills the space in between. (That’s why, in the exercise from the previous post, I suggest displaying your two drawings side by side in plain sight. This creates tension, which spurs action.) The challenge is sustaining tension, once created. Most of us have a low tolerance for tension, because it causes anxiety. Speaking out our current reality is embarrassing enough, but holding it up beside our aspirations? Talk about a shame fest. Why would I intentionally make myself look like a failure? Here’s why: because what you are already is, whether you speak it out or not. And what you are is not a failure. A failure has given up. If you still have vision, you cannot be a failure; you simply have not grown into your vision yet. And when you do, new vision will emerge. Growth is a sign of health, and implicit in growth is the fact that we are not yet everything we will ultimately be. This is a good thing. So let’s lay down these childish notions of failure and embrace the beautiful fact that abundant life is lived in the tension between vision and current reality. TCs help us sustain the tension. It’s way too easy to put our aspirations on the shelf when things get tough, and they quickly become out of sight and out of mind. Or if you’re naturally a visionary type, then it can be easy to live in denial about your current reality, prancing around as if you already embody the vision you purport. Speaking both things out is a reminder to you, if no one else, that both elements are true and important. It’s a simple way to hold the tension. TCs move us toward greater clarity. Any time we speak something aloud to another person, we are forced to explain ourselves more clearly than when we talk to ourselves. We may think we know what our vision is, but when we hear ourselves saying it out loud, we suddenly hear how vague and unclear it is. So we try again, and again, and each attempt brings greater clarity. TCs provide automatic accountability. Even if you don’t ask the other person to hold you accountable, simple by sharing your place of tension with them, you will feel a certain level of accountability. You will realize you can’t hide in secrecy anymore, because your secret’s out. In reality, you have just increased the tension, which is a good thing. The higher the tension, the quicker you will want to get into action. TCs inspire others in their own transformation journeys. People are often embarrassed to speak out a TC, fearful they will be judged. But more often than not, the other person will be drawn toward your vulnerability and courage, and will be inspired to reflect on their own journey. You will see a light come into their eyes as they listen, and they may even be prompted to share a personal place of growth. Obviously it is fulfilling to inspire others, but it also serves your own journey to gain companions along the way. In this way, TCs are mutually transformative. Here is a simple template to get you started. But of course, feel free to adapt it to your own purposes. 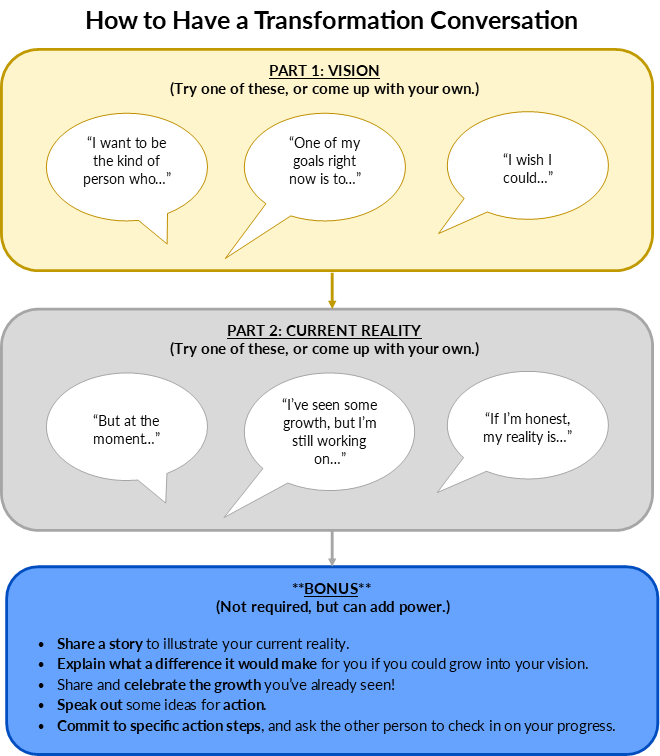 As long as you share vision and current reality, it “counts” as a Transformation Conversation. Below are several examples, showing the variety of topics this can be used for. I want to be the kind of person who can remain present in the midst of conflict. But at the moment, everything in me wants to run away, or at least shut down. I can feel the anxiety in my body – I start to shake and get really tense, I look down to avoid eye contact, and it almost feels like I lose the ability to speak. Very frustrating! I want to be able to keep breathing and be able to think clearly, so that I can speak up for myself. If I could do that, I would experience so much less anxiety in my life, and I would be able to contribute my gifts even in the midst of conflict. A goal of mine at the moment is to cook dinner 4-5 times a week. I’m getting close! I can usually do 3 times a week now, though it still takes conscious effort. But a year ago it was only once a week, so that’s progress! I’ve felt really stuck lately when it comes to my meditation practice. Ultimately, I want to meditate twice at day for 20-30 min. Right now, I’m doing good to do it once a day for 10 min. Some days I forget altogether. This week I’m going to set an alarm on my phone to remind me to meditate right before lunch. Would you mind asking me how it’s going a week from now? This weekend I want to do my laundry and clean my bedroom. I speak out TCs literally every day, usually without even meaning to. I’ve experienced their power, and have learned first-hand that when I say something out loud to another person, I’m 300% more likely to take action toward my goal. But trust me, when I first started out, it felt awkward and scary. If you’re not used to sharing this kind of stuff in casual conversation, then I encourage you to create “formal” opportunities for yourself. Meaning, tell your spouse or a trusted friend that you are experimenting with a new tool for transformation, explain how it works, and then ask them if they would be willing to listen to your example. It may feel stilted at first, and that’s totally ok. New habits always feel awkward in the beginning. It doesn’t mean you’re doing it wrong, it means it’s a new habit. Over time, you’ll find it becomes more and more natural, until you do it without thinking about it. Using the template above, write out a short Transformation Conversation. Be sure to include both “vision” and “current reality”. Read what you wrote out loud to yourself when you finish. Close your eyes and think about three people in your life who might be encouraged or challenged by your vision and current reality. Imagine yourself sharing the above TC with them. What do you notice in your body as you picture the scene? Speak out your TC to three “safe” people who are invested in your growth and well-being. If you can do it spontaneously, great! If not, don’t be afraid to set yourself up for success by letting them know ahead of time that you want to share about an area of growth you are seeking. If you did the exercise from the previous post, consider sharing your drawings with them as well. This is the second post in a series on “How Change Happens.” If you missed the first post, “Try This On: Change is Possible,” you can find it here.